FilmJuice Competition: To celebrate the release of one of the best films of the year Sicario 2: Soldado we've got TWO Blu-ray copies to Give Away! For your chance to win, simply answer this question (entry details at the bottom of page): Which start of Marvel's Avengers: Infinity War stars in Sicario 2: Soldado? 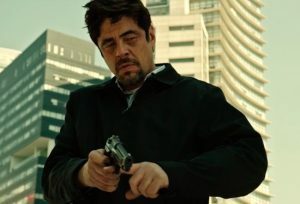 In SICARIO 2: SOLDADO, the merciless drug war reaches new extremes as cartels begin trafficking terrorists across the US-Mexican border, pushing law enforcement to the brink of morality in order to end the terror. 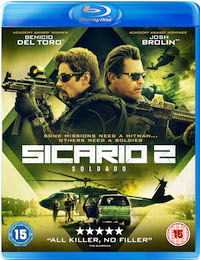 A heart-pounding sequel to the critically acclaimed Sicario, SICARIO 2: SOLDADO arrives on digital download from 22nd October and on 4K UHD, DVD, Steelbook, Blu-Ray™, DVD Double Pack, Blu-Ray™ Double Pack and UHD Double Pack from 29th October, courtesy of Lionsgate Home Entertainment UK. 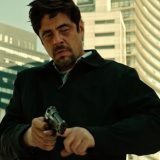 When the US government begins to suspect that cartels are trafficking terrorists across the border, federal agent Matt Graver (Josh Brolin; Sicario, Avengers: Infinity War) calls on the mysterious hitman Alejandro (Benicio Del Toro; Sicario, Star Wars: The Last Jedi) to escalate the war in nefarious ways. Alejandro kidnaps the wanted kingpin’s daughter (Isabela Moner; Transformers: The Last Knight) to inflame the conflict, but when the girl is seen as collateral damage, her fate will divide the two men and push them to question what they are fighting for. From Stefano Sollima, the director of critically-acclaimed series Gomorrah, and with a forceful supporting performance from Academy-Award® nominee Catherine Keener (Get Out, Being John Malkovich), SICARIO 2: SOLDADO is an uncompromising, unflinching look into the ruthless world of drug cartels – and the extremes that some will go to end the terror.